Advanced CCTV camera technology has provided Online Pipe & Cable Locating with an effective way to diagnose almost any issue with underground pipes and help customers save time and money. No excavation required – unlike traditional methods which are more expensive and more time consuming. No-dig and non-destructive – Because CCTV camera inspection does not require digging or excavation, it is completely non-destructive. This means the cost of inspection and or diagnosis of a problem is minimal compared to breaking up above ground structures and excavation in order to get to the pipe or asset. 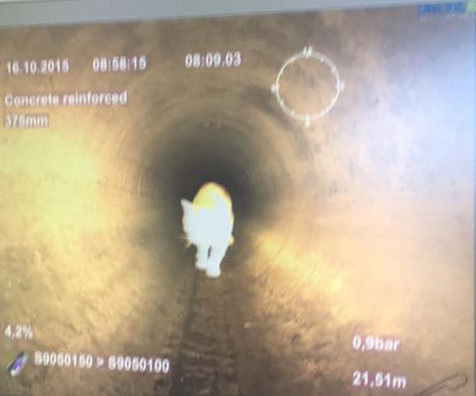 Cost-effective – CCTV camera inspections are the most efficient way to determine the condition and possible issues within pipes, drains, and sewers. Through CCTV you eliminate the costs of excavation just to identify issues. Fast and precise – CCTV inspections can pinpoint issues quickly and deliver reports and results faster than any other method. Where can CCTV camera inspections be performed? What will a CCTV camera inspection reveal? When do I need a CCTV camera inspection? If you notice any of the following ‘signs’, you should consider calling us to enquire about a CCTV camera inspection. As it will often save you time and money in the long-term, we recommend taking a “sooner rather than later” approach to investigating issues with underground assets. If you have any questions about CCTV camera inspections or require further information on any of our services, please call us on 1300 665 384 to discuss your needs.